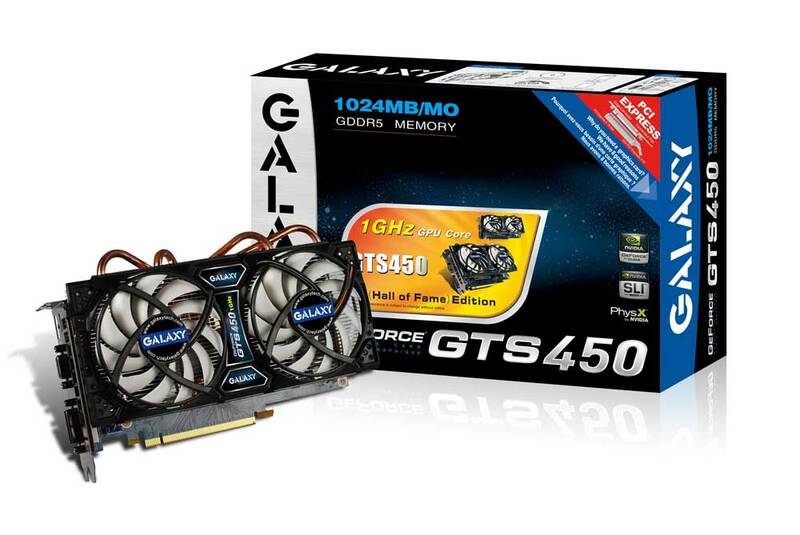 Galaxy today announced The Galaxy GTS 450 Hall of Fame edition, its the fastest Geforce GTX 450 card on the market until now with 1000Mhz for the GPU , 192 shaders units running @2000Mhz and 4100Mhz for the memory, thanks to 0.4ns GDDR5 . “Our new GTS 450 Hall of Fame edition demolishes the competition with a core clock of 1000Mhz.” said Shane Vance, US Sales, Galaxy. “Our custom cooler, Samsung 0.4ns GDDR5 memory and Galaxy designed board allow us to achieve these insane speeds.. The Galaxy GTS 450 Hall of Fame edition comes with a custom cooling solution featuring 2 PWM fans and 4 heatpipes, keeping the card cool under clock speeds that devour today’s games. It comes with 3+1 phase power supply.